– There are advantages and disadvantages to arbitration clauses. Advantages include lower cost (sometimes) and greater flexibility, and disadvantages include limited discovery and limited grounds for appeal. So, it is important to consider these advantages and disadvantages as they pertain to every situation, and to not simply agree to an arbitration clause. – Define your terms carefully and clearly, including when the contract will be completed, when payment will be made, when warranties begin to run, etc. 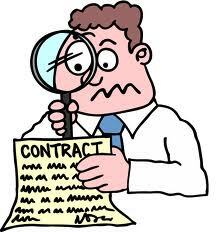 – Be sure that the terms of your contracts, especially management agreements, are consistent with your governing documents. For example, be familiar with any limits on the length of the engagement and the process for terminating the manager or management company that are set forth in your governing documents, and be sure the contract is consistent with these provisions. – Be sure that you satisfy any necessary preliminary requirements before entering into a contract. For example, before entering into a construction contract, get membership approval and/or zoning approval, if necessary. Hello. We have enjoyed your blog. Quick question: Can an HOA “suddenly” (in contravention of original CC&Rs and prior Amendment) propose and pass an amendment prohibiting ALL owners from renting their property? (Facts behind this Q: My husband and I purchased a home in St. George approx. 8 years ago, for retirement/investment purposes. We have had it rented ever since. New proposed CC&R amendment says an owner can only rent his property for maximum of two years during the period of their ownership of the lot. This takes away our whole purpose for buying the home, effectively depriving us of our property. Can the HOA do this (assuming the amendment passes by the required 67%)? Thank you. Elizabeth, we cannot give specific legal advice without having read the HOA’s governing documents or knowing the details of the amendment’s passage, but generally speaking, yes, declarations can be amended to limit owners’ ability to rent their units. However, best practice is to include a grandfather provision to protect the rights of owners who acquired their units before the amendment is passed. There have been successful challenges of these types of amendments in other states. Please feel free to call our office at (801) 519-2555 if you would like to discuss your situation in greater detail.